Following the wettest winter on record, a new online movie has been launched to educate drivers about the risks associated with aquaplaning, a dangerous phenomenon caused by low tyre tread depth on wet roads which results in the car losing contact with the road surface. 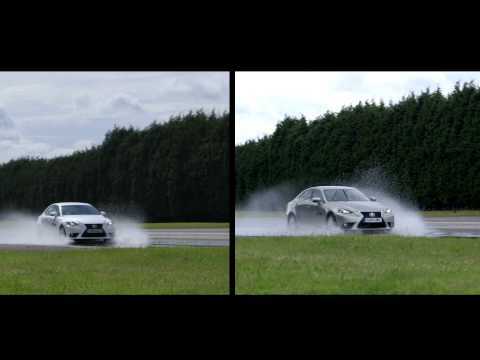 In the dramatic clip, a car with low tyre tread depth can be seen aquaplaning on a flooded road surface, dangerously continuing to travel in a straight line despite the driver turning the steering wheel furiously in an attempt to make the car change direction. "Our latest movie and animation illustrate perfectly why it's so important to regularly check your tyre tread depth at this time of year," comments Stuart Jackson, chairman, TyreSafe. 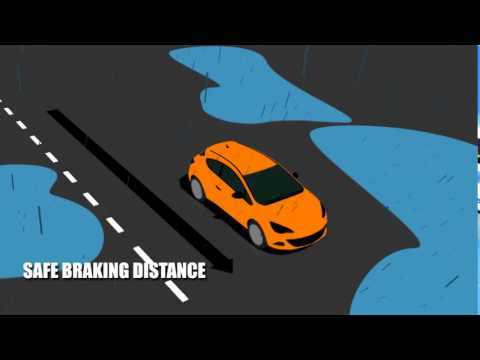 "Not only are braking, cornering and acceleration all affected by low tread depth, but in heavy rain, there's a real risk of aquaplaning which could cause you to lose control of your vehicle, placing yourself, your passengers and other road users at an increased risk of being involved in an accident." Adequate tread depth is important for safety in wet conditions as the tread grooves help to remove the water from the contact patch between the tyre and the road surface. As the tyre's tread depth wears down, its ability to remove water from the road decreases meaning that grip levels are reduced and stopping distances are extended. In extreme circumstances when the tyre has insufficient tread depth to clear the water properly, increased water pressure causes the tyres to lift on top of the water surface and lose contact with the road surface. During this dangerous aquaplaning situation any input from the driver such as pressing the brake or turning the steering wheel has no effect on the vehicle, leaving it at an increased risk of being involved in an accident. Current UK law requires car drivers to have at least 1.6mm of tread depth across the central three quarters of their tyres, around their entire circumference. Drivers failing to comply with these regulations are not only at a greater risk of being involved in an accident, but could also face a fine of up to £2,500 and three penalty points for each illegal tyre. However, checking the condition of your tyre tread depth can be done quickly and easily by taking the 20p test. To perform the test, simply place a 20p coin into the main tread grooves of your tyre. If the outer band of the 20p coin is obscured when inserted into your tread, then your tyre is above the legal minimum limit. Meanwhile if the outer band of the 20p coin is visible, then your tyre tread depth may be dangerously low and should be inspected immediately by a tyre professional. Drivers unsure of how to perform the 20p test can find out more by visiting us for a free tyre safety check. Welcome to Manchester Tyre Service Ltd . To optimise your experience, cookie settings on the website are set to allow all cookies. By continuing your journey throughout the website, you consent to this. You can change these settings here.